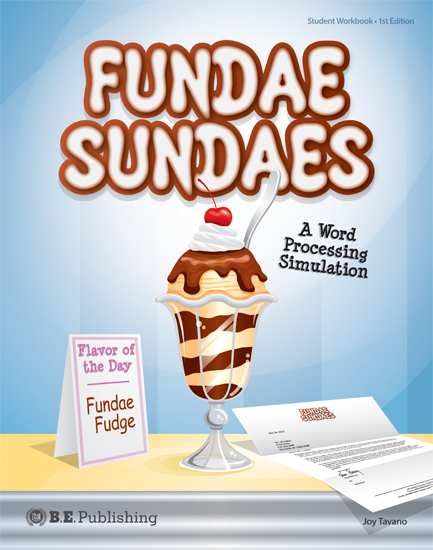 Students create word processing documents for a popular ice cream shop in this fun simulation. The self-paced activities in this textbook simulate real-world tasks such as designing news releases, creating lists of delicious menu items, and more. 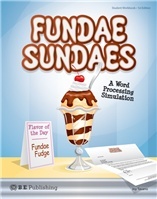 Fundae Sundaes brings learning word processing and document productions skills to life by engaging students in a theme that everyone loves… ice cream! Fundae Sundaes is a family-owned and operated homemade ice cream shop located in a busy college town on the outskirts of New York City. The friendly staff, cool atmosphere, and spectacular flavors, make Fundae Sundaes the 'go to' place when it comes to hanging out with friends and indulging in the best homemade ice cream the area has to offer. The Online Instructor and Student Resources for Fundae Sundaes are required and include Project Solutions and Performance Assessments. Performance Assessments serve as a reinforcement and allow students to demonstrate their word processing skills. Many projects require students to insert the Fundae Sundaes logo to create professionally-styled documents. Assessments measure students' ability to demonstrate the word processing skills in each project.